There was a time in the 1990s and early 2000s when recycling helped us feel better about our environmental impact. As programs sprouted in nearly every community and, single-stream programs made the process easier for consumers, we felt a sense of urgency in our weekly deposits. 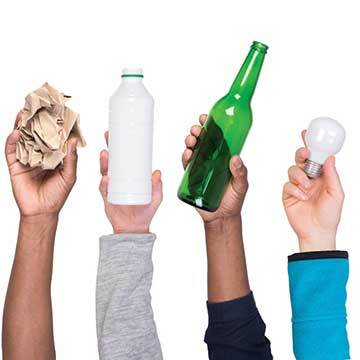 By 2009, Connecticut had managed to divert 65% of plastics from landfills through recycling and incineration. If we all did our part, the planet would be okay. Or so we thought. It turns out that we’d been using too much plastic for far too long. By 2010, word was spreading about an “island” of garbage floating in the middle of the Pacific Ocean (also known as the Great Pacific Garbage Patch), and public concern began to grow about the mess we had already made. No problem: with typical Millenial hubris, twenty-two-year-old Dutch wunderkind Boyan Slat conjured up “Wilson,” a floating rake that would sweep clean the debris and render our water pristine once more. Slat’s experiment has proven more complicated than he’d imagined, but even assuming his gadget works, then what? What do we do with all of the garbage it extracts? And what about the microscopic plastics it never catches? Is the whole enterprise “a misdirected activity” that “makes it harder for those working to focus the narrative to prevention,” as lamented by Marcus Eriksen, founder of the 5 Gyres Institute? While Slat tinkers with his design in the middle of the ocean, more and more plastic continues to accumulate around him. It is tempting to end this article here, in hopes that brevity and impact alone might send readers reeling against their recycling bins like punch-drunk boxers. When I tripped over that sentence in Carolyn Kormann’s article, The Widening Gyre about Slat’s attempts to clean up the Great Pacific Garbage Patch, I first doubted it, then inspected it, chasing its thread back to the original article in Science Advances to learn more about the methodology of the study. The picture only gets worse. As stated in the original report, “plastic waste is now so ubiquitous in the environment that it has been suggested as a geological indicator of the proposed Anthropocene era.” We are living in the Plastic Era. None of the plastics most commonly used in packaging are biodegradable. Or, to be accurate, they will break down in 450 years – if they are exposed to sun and oxygen. In all reality, that means that most of the plastic in landfills will never decompose. By 2015, we had generated an estimated 5800 metric tons of plastic waste, with very little of this ever recovered. Just based on sheer mass, this kind of waste generation is not sustainable. But then there is the chemical impact of plastic production. Many of the microfibers involved in plastics degrade to a very small or microscopic level, allowing them to be ingested by wildlife and ultimately, humans. Moreover, the polymers, resins, adhesives, and coatings employed in food packaging often wind up in the foods themselves, and several of these substances are categorized as toxic, bioaccumulative, and disruptive to the endocrine system. This is in addition to plastic fragments, or microbeads, which scientists at the University of Vienna have already documented in human stool samples. By any measure, we simply use and discard too much plastic, and it is harming our planet and us. Recycling alone cannot atone for our relentless, voracious appetite for plastic, and we must take other measures to rein in the bloating. In fact, we would do well to forget recycling and focus instead on reducing and reusing. This is not to say that we should stop recycling, but the reality of its impact is so minimal and our attention to it so outsized that we lose sight of the more pressing need to decrease the amount of waste we produce. It is like Slat, tinkering with his gadgetry in the Pacific while toothbrushes and milk crates continue to float into his gyre. of a million people choosing not to use a straw, it is the same as saving that space. Changing our mindset means being a conscious consumer, and stores in our area are already helping us to make more sustainable choices when it comes to mundane purchases. For starters, stores in Great Barrington, MA, have banned single-use plastic bags, a measure that Connecticut State Representative Maria Horn introduced for statewide adoption almost the minute she took office. Reusable shopping bags are a baby step in thinking sustainably, and while legislation can help encourage us to use them, there are many other hacks that help to reduce not only the amount of trash we produce but the amount of recycling we need to do. Guido’s Market in Great Barrington has long embraced environmental awareness, but when one of their baggers deposited a complimentary set of reusable produce bags in my groceries as a holiday gift, it caused me to rethink my vegetable purchases. Thanks to Guido’s, instead of buying greens encased in plastic or using plastic produce bags, I now use washable mesh bags to buy green leaf lettuce, kale, and escarole wrapped only in a rubber band, which I can also reuse at home. Sustainable purchasing requires intentional purchasing on the part of the store, too, and many merchants in the area are starting to provide bulk purchasing options for shoppers who want to use their own containers to restock on grains, legumes, and other sundries. The Great Barrington Co-Op features a bulk purchase section that contains not only these basics, but peanut butter, coffee, shampoo, and laundry detergent – to name a few. Bring your own container to the register or customer service counter and have it weighed without product in it, and then fill it up. I have been able to reuse a plastic bottle of Dr. Bronner’s liquid soap for over two years, and I have not bought a plastic jar of peanut butter in about the same amount of time. As I empty a container, I wash it and return it to my car where it is ready for the next trip to the Co-op. Travel demands reconsideration, as well, but a sustainable mindset and a few thoughtful purchases can minimize our plastic footprint. Refillable travel-size toiletry containers negate the use of complimentary hotel bottles, and collapsable or reusable water bottles and lightweight bamboo cutlery save money and reduce our environmental impact, which is especially important when traveling in countries where recycling and waste disposal are less modernized. All of these considerations demand more of the consumer. I am constantly cycling reusable containers through my household and back to my vehicle, and the attention I pay to my plastic consumption extends to other ways in which my existence strains our natural resources. Some people would consider these measures a hassle, but I find them helpful as mechanisms to induce more intentional purchasing. Not only am I asking myself, “Do I need this?” but I am asking myself, “Do I need this, packaged in this way?” The answer, usually, is no. The magazine features the tri-corner area: north from Hudson, Claverack and Hillsdale south through Copake and Ancramdale NY down Route 22 to Amenia and Millbrook, and down Route 82 from Pine Plains to Millbrook in New York; from Great Barrington through South Egremont MA and south into Canaan CT; further south through Lakeville and Sharon in Connecticut down to Kent and New Preston – and everything in between – with Millerton at its center.